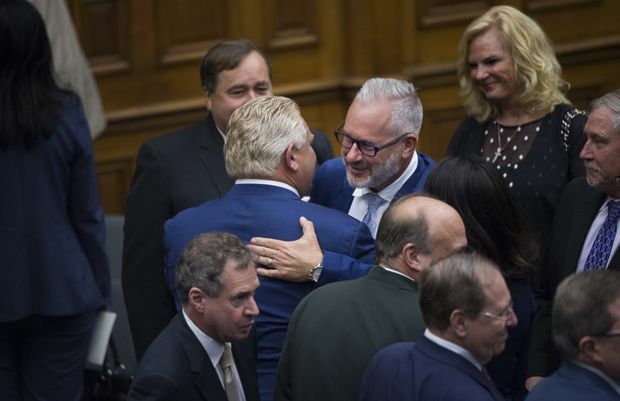 Ontario Premier Doug Ford (L) is greeted by Mike McCormack, president of the Toronto Police Association, after the Lieutenant Governor of Ontario delivered the Speech from the Throne at the Ontario Legislature on July 12, 2018. The last thing that Toronto needs as it struggles with a surge in gun violence is a fight between its police union and its city leaders. But this summer the fight is on − and it’s a bitter one. On one side, stands Mike McCormack, head of the police union; on the other, Police Chief Mark Saunders and Mayor John Tory. They have been at odds over the staffing of the force. Mr. McCormack says the force is drastically short of officers. Cops are burned out from racing from call to call. He blames the mayor, the chief and their attempt to streamline the police service. The mayor and the chief insist there are enough cops to do the job. They vow to press ahead with modernization, bringing the force into the 21st-century. The recent spike in gun violence has brought the quarrel to a head. Chief Saunders and Mr. McCormack are giving duelling interviews in the media. 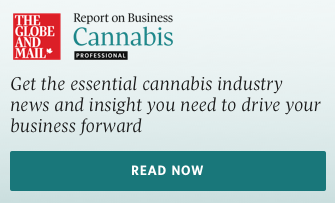 Their views of the problem and solutions are starkly opposed. Mr. McCormack says the force needs hundreds more officers to meet its commitments. Chief Saunders says the answer is to use police resources more wisely. Police should not be doing things like answering noise complaints, directing traffic and filling in for crossing guards. If others could do those tasks, he argues, highly trained, well-paid police officers would be freed up for their most important job: fighting crime. The chief and the mayor have the clear edge in this frustrating argument. Toronto, as with other Canadian cities, has been struggling for years to control the high cost of modern policing. In 2017, after a year of study, a task force recommended a sweeping reorganization of the force to make it more efficient, flexible and affordable. Mr. McCormack always insists he supports reform. His behaviour often undermines that claim. The mayor notes that the union has blocked reforms to shift schedules. Those reforms would allow commanders to deploy resources more effectively. Mr. McCormack replies: “You can’t deploy officers you don’t have.” He accuses Mr. Tory of trying to deflect blame for the gun violence. And yet it is Mr. McCormack who has been pointing the finger most, exploiting the headlines over gun violence to bolster his argument that authorities are starving the force of personnel. The confrontation shows no sign of going away. Even the announcement this week that the city was going to spend $3-million to send extra officers into the streets at key times seems unlikely to defuse it. A sharply worded letter to Mr. Tory from a veteran police officer showed how heated things have become. It said a decision to dismantle an anti-gang task force contributed to the rise in gun violence. The officer called Chief Saunders a “puppet on strings” pulled by Mr. Tory. Perhaps Mr. McCormack is feeling that the advent of Mr. Ford, a cheerleader for the police, gives him the chance to push back against modernization and get his way over staffing levels. He may well be right. It would be a shame if he were. Mr. Ford’s government is trying to cut costs after years of reckless overspending by the Liberals. Controlling policing costs has to be part of any effort to bring government spending back into line, and Toronto’s modernization drive is a key to that control. If he really cared about making government more efficient, Mr. Ford would throw his support behind modernization. Toronto needs good, robust police work to respond to the challenge of gun violence. What matters most is using resources intelligently. Sending a cop out to tell some kids at a neighbourhood party to turn down the music is not a smart use of policing time. The chief and the mayor should keep standing up to Mr. McCormack and press ahead with their plan to transform the police force.